The 71-year-old soul-singing icon, Patti LaBelle, doesn’t let dust settle under her feet. A true Gemini, Miss Patti, as she often refers to herself, does it all. After making her name in the 1970s as the one-and-only Lady Marmalade, LaBelle (who to this day is a touring artist) has developed quite the repertoire. 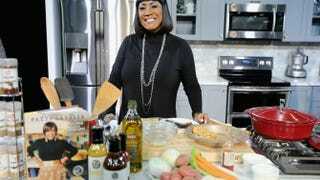 The chaunteuse has dabbled in acting (shoutout to Mrs. Wayne and those prune cobblers), rebranded herself as a chef—with a cooking show, desserts and line of marinade sauces—I mean, what respectable chef doesn’t have a sauce? And LaBelle even gave Dancing With the Stars a go. If this isn’t enough, The Voice recently announced that Patti LaBelle will join season 10, as Christina Aguilera’s adviser (apparently, advisers have advisers). Teach the children, Miss Patti! On the cusp of the BET Honors, we spoke with Miss Patti about her illustrious career, YouTube sensation James Wright, life lessons and her burgeoning dessert empire. Patti LaBelle is stacking cakes. Literally.